Years from now, "X-Men" will stand as the model of the right way to make a movie about comic-book superheroes, and with good reason. Directed by Bryan Singer ("The Usual Suspects"), "X-Men" excels at doing what few comic-book movies even attempt: It makes superheroes seem like real people, which is what the X-Men's co-creator, Stan Lee, wanted from the very beginning. When Lee and artist Jack Kirby first collaborated on "The X-Men" for Marvel Comics in 1963, their goal was to create superheroes realistic enough that you could half expect to meet them on the street. Unfortunately, few filmmakers take superheroes seriously enough to give them a realistic treatment. As a result, virtually every movie based on a Marvel Comics character has been a disaster. The Roll Call of Infamy includes: "Howard the Duck," "Captain America," "The Punisher," "Nick Fury, Agent of S.H.I.E.L.D." and "The Fantastic Four." In fact, "The Fantastic Four" is so bad that it remains unreleased, even on home video. At least DC Comics was lucky enough to get two good films each out of its "Superman" and "Batman" franchises. That half of the movies featuring Superman and Batman are stinkers says more about the inept filmmakers who produced them than it does the characters. Only a master of self-indulgent excess like Joel Schumacher could produce a pair of films as bad as "Batman Forever" and "Batman and Robin." But enough talk of the failures. "X-Men" stars two superb, classically trained actors: Patrick Stewart ("Star Trek: The Next Generation") and Ian McKellen ("Gods and Monsters"). Stewart plays Prof. Charles Xavier, a powerful telepath who runs a school for "gifted youngsters." The youngsters in question are mutants -- human beings born with genetic mutations that give them powers and abilities far beyond those of mortal men. Xavier's mission is to teach these young mutants to control their abilities so that they will be able to live in a society that fears and hates them. Which brings us to Magneto (McKellen), who is a Holocaust survivor determined that mutants not meet the same fate his parents did at the hands of the Nazis. For Magneto, coexistence between mutants and the rest of humanity is a pipe dream, and Magneto's fears seem to be confirmed when an ambitious U.S. senator, played by Bruce Davison, proposes legislation that would require all mutants to register with the government. If there is to be a war between humans and mutants, Magneto and his Brotherhood of Mutants -- Mystique (Rebecca Romijm-Stamos), Toad (Ray Park) and Sabretooth (Tyler Mane) -- mean to win it. Only Xavier and his X-Men -- Cyclops (James Marsden), Storm (Halle Berry) and Dr. Jean Grey (Famke Janssen) -- stand between Magneto and all-out war. Into this mix fall the mysterious Logan, also known as Wolverine, played by Hugh Jackman, and Rogue, played by Oscar-winner Anna Paquin. Logan's mutant ability is rapid healing, a superpower that allowed someone to graft a nearly indestructible metal to his skeleton and equip him with razor-sharp, retractable claws without killing him in the process. 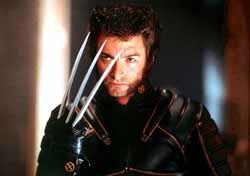 Hugh Jackman plays the razor-clawed mutant, Wolverine, in "X-Men." Rogue, meanwhile, can absorb the abilities and memories of anyone she touches. Unfortunately, she cannot control her power, and she runs away from home after her first kiss accidentally lands her boyfriend in a coma. Caught between Xavier and Magneto, the two have to decide which side to take. It's relatively easy to bring some superheroes to the big screen. Superman and Batman have changed little in the 60 years since they were introduced. But the X-Men have a 37-year history as convoluted as that on any soap opera and a cast of dozens. So, how do you compress that much history into one movie, remain faithful to the original source material and not confuse newcomers all at the same time? Singer's elegant solution is to combine the premise of Lee and Kirby's original comics with the Mutant Registration Act subplot from the comics of the late 1980s and the core characters of the current X-Men comics. It helps that he also gets excellent performances out of virtually all of his cast members, the only real exception being the horribly miscast Halle Berry in a role that should have gone to Angela Bassett. And then, of course, there is Jackman. The Australian actor is a newcomer to American screens, but his turn as Wolverine, the most popular "X-Men" character, is a guaranteed star maker -- asuming he doesn't get typecast playing short, irritable mutants with bad hair. "X-Men" may be a story about comic-book characters, but it's ultimately a simple tale about oppressed and misunderstood minorities everywhere. So, while the film features plenty of in-jokes that only long-time fans of the comic books are likely to get, it is easily accessible to newcomers. It's amazing what can happen when filmmakers don't treat their subjects as jokes.